On April 21st I wrote in my article “Market Astrology: Comex Update This Is Not Another 1980” that a correction beginning April 28th would be an attempt to take out silver creating a panic that would resemble 1980. I wrote that the attempt would not work and on May 17th silver would stabilize and mark a turning point for the metal to not return to the former pattern experienced in the 80’s. This was in large part due to Jupiter (rules silver) in transit through the United States 4th house (silver and mining) making a square to Pluto in the 2nd house of banking demanding fair play. It could also mean a large financial institution took delivery or was forced to cover a large short position. Whatever the case the word was out on the 12th of May as most likely gossip on the floor spread and the selling stopped. A small bounce and then on May 17th another attempt to take the metal through support that again failed just as I predicted. From that point on May 17th further attempts to break that support have failed setting the metal up for a major move to the upside. 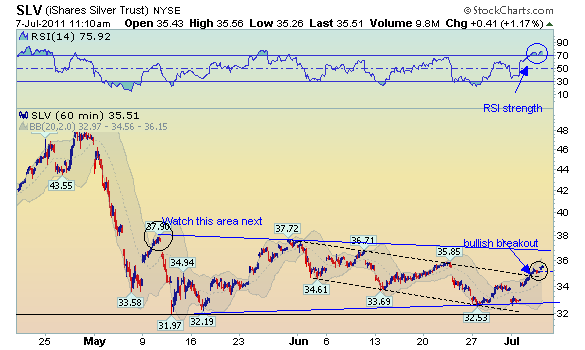 On Jeff’s chart above, the final line of resistance that needs to be broken is a close above 37.91. On July 11, 2011 Mars in Gemini will make a powerful trine to the US Saturn (gold). This could be the punch that is needed to break through 37.91. 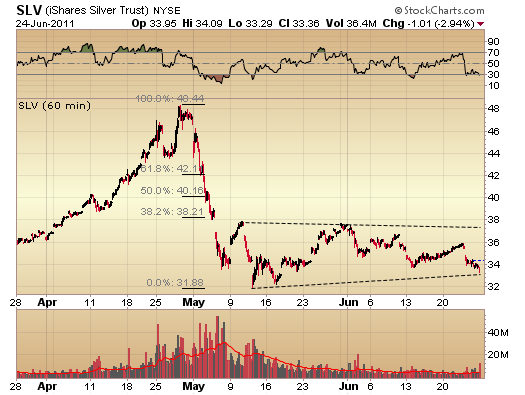 Keep a close watch on July 11th and July 20-25 for big moves that would take out that line of resistance marking a safe entry point for some of the silver ETF’s. In August I do believe there is a strong potential to break through $50 and keep running higher. Another international financial shock similar to March 4th could send silver through $50 August 20-23rd. I read that Mercury will transit through Sagittarius between 7/19 – 7/31. Will this also exhibit a strong rally in gold/silver? Also, do you see a critical reversal date for the metals and the stock market around 7/27? Mercury will be in Leo and then goes retrograde at 1* Virgo on 8/2 for the metals i think this will have more to do with Comex delivery problems. Comex must meet demands but likely does not have best interest at heart for those it is supposed to serve. I don’t see a major correction in July. I see more inflation in august, so everything is going to go up. your Silver prediction till date is true, where as all were in bearish thought for silver. Based on your above posting, I have been keeping a close eye on the July 11th punch that you forecasted (Based on Mars in Gemini). As you know, It was down today over 2%…any idea as to what happened? very thanks for your predictions on silver which I believe will definitely work but now I am confused on 11th july correction. please give some useful advice on the same. Looks like we’re getting that silver breakout you were calling for. I don’t think anybody will blame you for being a few days off. We should all know the market tries to make everyone look like a fool. My Mars/Saturn (gold) transit theory hit on July 11th where gold made a big move but not enough to pull it off for silver breakout. The transit period is through July 13th (today) and looks like we will get it done. There is a plus minus of a couple days with Mars and next time i will remind everyone of that. Generally I don’t read article on blogs, however I wish to say that this write-up very pressured me to try and do it! Your writing taste has been surprised me. Thank you, very great article.